Noah Irvine, Ontario Teen, Sent A Letter On Mental Health To Every MP. Only 40 Replied. He said the response rate was "abysmal." 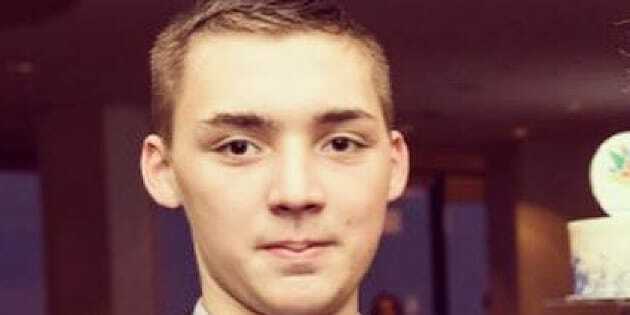 Seventeen-year-old Noah Irvine mailed a letter calling for improved mental health services in Canada to every MP in the country. Noah Irvine says his mission to raise awareness about mental health in Canada was solidified when, at age 15, he had to visit two graves. In one lay his mother, who committed suicide when he was five years old. She was 24. In the other, his father, who lost his battle with mental illness a decade later. He was 40. I'm one voice but I can make a lot of noise. "I believe that no 15-year-old child should lose their parents within a span of a decade to mental health and suicide," he told HuffPost Canada. "That's when I finally said, 'you know what? I'm one voice but I can make a lot of noise.'" Irvine, now 17, kicked off his effort to promote mental health issues in the country earlier this year. He mailed a letter to every single member of Parliament, explaining how mental illness has touched his life. In his letter, he called on MPs to fight for more funding for mental health services and to work toward establishing a ministry dedicated to the issue. He challenged MPs to speak to their constituents about mental health, to reach out to caregivers and to the families of suicide victims. He asked them to care. "We continue to fail in providing for the mentally ill. My mother and father are prime examples of our country failing to provide to the mentally ill," Irvine wrote in the letter. "Please do not let my mother's death have been in vain or my father's death. Both of their deaths and the thousands that die every year should fuel your fight in ending this crisis." Earlier this week, the Guelph, Ont. student's campaign reached a tipping point. He saw that in more than six months, only 40 MPs had replied. It was a "pretty abysmal" response rate, Irvine told HuffPost Canada. And if the lack of response wasn't aggravating enough, he said, it was what some MPs told him that added to the frustration. "I had called well over 70 constituency offices from B.C. to Newfoundland and the response that I received from a vast majority...was 'you're not our constituent, this is not our concern,'" he said. "Well, I have serious issues with that statement." Irvine said any efforts to improve mental health services in the country won't stop at the boundaries of Guelph or any other constituency. "My postal code should not dictate whether or not I get a response from members of Parliament," he added. That response led him to reach out to the media. He first spoke to a local outlet, Guelph Today, on Tuesday and then to Global News. The calls started coming in. Health Minister Jane Philpott spoke to Irvine on Wednesday. Her press secretary told HuffPost she "expressed her sympathies for his tragic loss" and apologized for her late response. Irvine said the two will meet in Ottawa this September. The Prime Minister's Office also reached out. When he spoke to representatives, Irvine expressed his disappointment that so many MPs from Trudeau's party didn't respond to his letter. Out of the 40 that replied, 22 were Liberal MPs. A response from Trudeau to Irvine is "working its way through the system," a spokeswoman for the PMO told HuffPost. The prime minister will also contact Irvine "directly." Trudeau and his ministers have pointed to mental health as a priority for their government. In the latest budget, the Liberals earmarked $5 billion over 10 years for mental health initiatives. That promise didn't square with the response rate to his letters, Irvine said. "For a party that says mental health is a top priority, I would have expected that number to be higher," Irvine said. He's still waiting on responses from other cabinet ministers. "For some issues, they only pertain to one ministry. For this issue, mental health, it affects every facet of the Canadian economy, every facet of our social system in Canada, our defence, our correctional facilities. It affects far more than just health," he said. Some leaders of other parties didn't respond until the media picked up Irvine's story. He said NDP Leader Tom Mulcair reached out to him with a "gracious apology." Conservative Leader Andrew Scheer will be replying to Irvine's letter, according to his office. Elizabeth May has yet to respond. "The media pressure is helping," Irvine said. The student's campaign isn't only targeting the federal government. Irvine said he sent similar letters to six Ontario MPPs in March. Three went to provincial party leaders, Liberal Premier Kathleen Wynne, Progressive Conservative Leader Patrick Brown, and Ontario NDP Leader Andrea Horwath. Out of the three only Wynne replied. Irvine said she sent him a "compassionate" letter. He also sent a letter to Ontario Health Minister Eric Hoskins. The minister's office eventually reached out, Irvine said, but that wasn't enough. "I want him to respond directly, as his boss did," he said. "If Premier Wynne can make the time to respond I would assume her health minister could as well." Hoskins office told HuffPost he will be responding personally to Irvine's letter. Horwath will be sending a personal message to Irvine, according to a party spokesperson. HuffPost has reached out to Brown's office. One of Noah Irvine 's earliest allies in his campaign to promote mental health issues was Liberal MP Lloyd Longfield. Irvine has developed a close bond with his local Liberal MP, Lloyd Longfield. Irvine volunteered on his campaign, and since Longfield was elected the two have met many times to discuss mental health issues and services. He said Longfield was the only candidate in the riding who was willing to listen to him during the last federal election. "He's a good guy, he's been with me through this whole process," Irvine said. He also listed MPs Harold Albrecht, Rob Oliphant and Phil McColeman as early allies in his cause. He said Wellington—Halton Hills MP Michael Chong also sent him a letter "in the middle" of his campaign for the Conservative party's leadership. Irvine said those MPs showed a "deep commitment" to the cause in their responses to his letter. And that dedication, Irvine said, is what he wants MPs to show constituents who might be facing mental health battles or caring for loved ones fighting their own. He wants Canadians to know that there are people out there who care, "who have a deep drive in wanting to fight for all Canadians to be better funded and be better supported by the federal government and their provinces." I firmly believe that in this country we can stop it and we can make a huge difference in the lives of thousands of Canadians. He wants to spread the same message to Indigenous communities. "We care," he said. "I care about what's happening on reserves and I think it's appalling." "I care, and I hope that our politicians after this will care and will do something more to better your lives." Irvine said the personal toll mental health has had on the lives around him has fuelled his commitment to the cause. "I don't believe that any 15-year-old child, or any mother or any father across this country, or anybody, should lose a loved one, a friend, a family member to mental health or suicide," he said. "I firmly believe that in this country we can stop it and we can make a huge difference in the lives of thousands of Canadians."